Hoya flowers are just as varied as the leaves, despite the fact that all are shaped like five pointed stars. They grow in umbels, usually with many flowers per umbel. 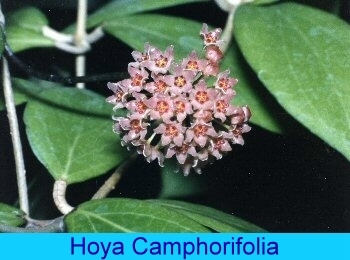 Individual flowers range in size from as small as four to five millimetres in diameter (Hoya bilobata Schltr.) to well over three inches in diameter (Hoya imperialis Lindl. and H. macgillivrayi F. M. Bailey). The number of flowers per umbel varies from one (H. pauciflora Wight.) to 55 or even more. Hoya coriacea Blume has been known to have as many as 70, each measuring nearly 2 centimetres in diameter. The single flowered Hoya pauciflora Wight makes up for its paucity by its flower size of nearly an inch and a half in diameter. Hoya flowers vary in textures as well as size, some being glabrous and shiny and some being quite hairy. They also vary in color. They come in the purest white, varying shades of pink from almost white to rubber-doll or bubble-gum pink, yellowish-pink, yellow, green, purple, brownish-red and brown. There are some that are so dark that they are often referred to as black. Until recently it was thought that a true red hoya was not ever likely to appear but recent discoveries make that seem possible. One of the two clones of Hoya mindorensis Schltr., from the Philippines, which are currently in circulation, comes very close to being a true red. Blue still does not appear to be represented in the Hoya genus.